PLYMOUTH — Kelly Pannek is on pace to graduate from the University of Minnesota in the spring with a finance degree. With two internships in wealth management also on her resume, she is a prime candidate to get hired in the business world. The 2018 Olympic champion plans to put her off-ice-career on hold, thanks to a landmark deal involving USA Hockey last year. “I plan on just playing hockey as long as I can because I can,” she said. That used to be a challenge for the nation’s top female hockey players. 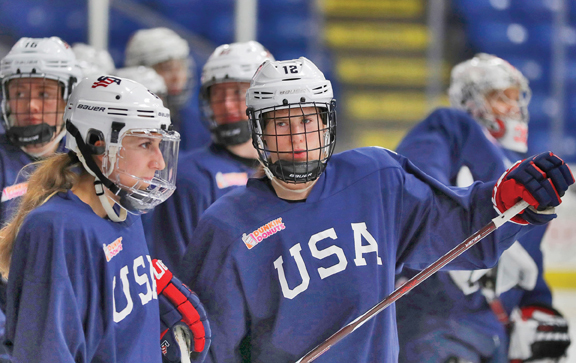 After threatening not to show up at the 2017 world championship at USA Hockey Arena, the top American female players in the sport agreed to a package of improvements, including one that helped their bottom line. Post-graduate hockey players can make about $70,000 a year and about $130,000 annually in Olympic years.